WASHINGTON — The deputy secretary of the Department of Veterans Affairs says he still intends to punish two senior officials accused of manipulating the agency’s hiring system for their own gain. Deputy VA Secretary Sloan Gibson demoted Kimberly Graves and Diana Rubens last month after they forced lower-ranking managers to accept job transfers and then stepped into the vacant positions themselves, keeping their senior-level pay while reducing their responsibilities. The demotions were later reversed by federal judges, who said higher-ranking officials knew about the women’s plans and did nothing to stop them. Gibson said Tuesday he did not believe it was right for Rubens and Graves to go unpunished when charges against them were sustained. “I do not believe it’s the intent of Congress, and I don’t believe it’s the right thing” to allow employees who commit wrongdoing to go unpunished, Gibson told reporters in a conference call. “I intend to take some punitive action” against Rubens and Graves. Rubens earns $181,497 as director of the Philadelphia regional office for the Veterans Benefits Administration, while Graves receives $173,949 as head of the St. Paul, Minnesota, benefits office. Gibson did not specify what action he would take against Rubens and Graves, but said he was unlikely to remove them from the government’s Senior Executive Service, as he did in demoting them last month. Two judges reversed his decisions in separate rulings, arguing that penalizing Rubens and Graves was inconsistent with the VA’s failure to discipline the higher-ranking officials. 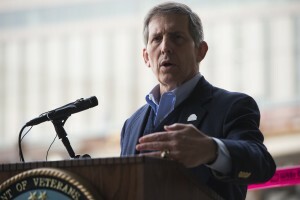 In a related development, Gibson said he was launching a one-week investigation of two other VA officials named in the judicial rulings on Rubens and Graves: Danny Pummill, a top benefits administration official in Washington who was aware of the women’s actions, and Beth McCoy, an official who also pressured a regional manager to leave his position. McCoy was never disciplined and was later promoted. Gibson said he intends to interview both Pummill and McCoy, adding that “if there is evidence of misconduct not available previously, I will take actions” against them.